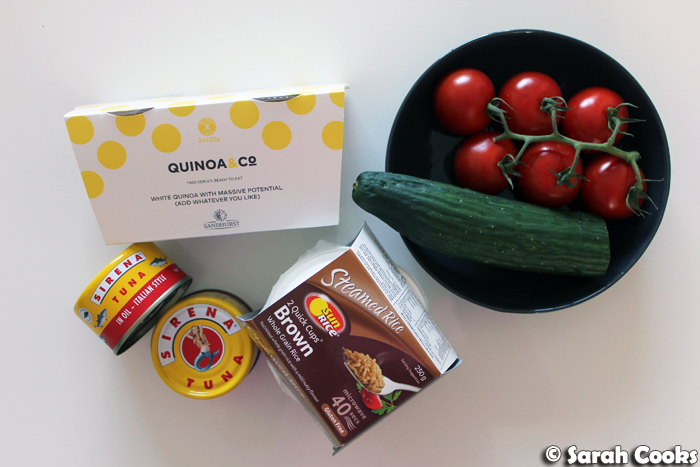 Welcome to what I hope will be a semi-regular feature on my blog: Meal Prep Monday. 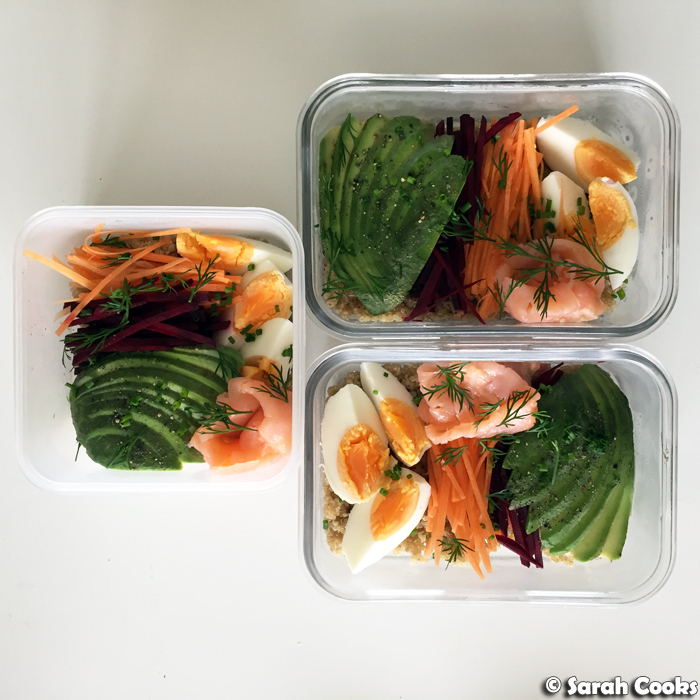 As I've mentioned in my past Unblogged Files, I've been getting into the habit of making my lunches for the week in advance, to save money and eat a bit healthier. I'll usually make four portions of a healthy lunch on a Sunday, and treat myself by eating out once a week. 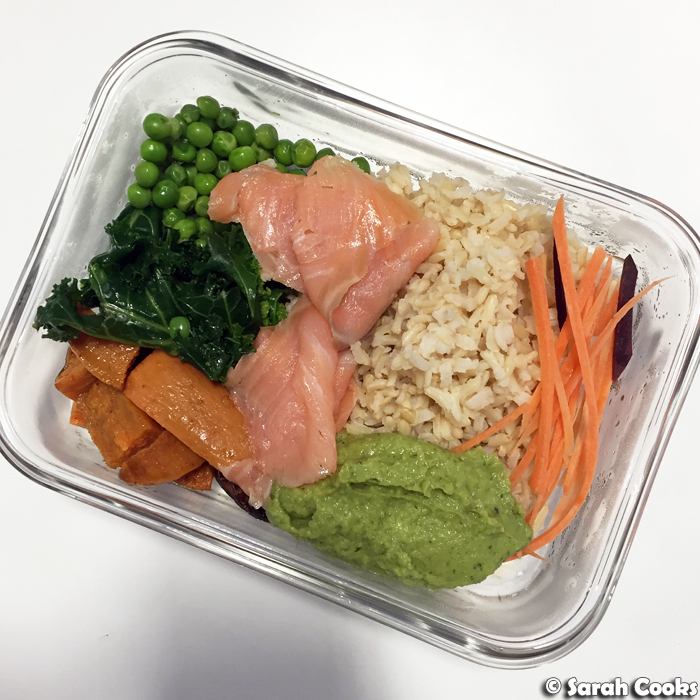 That's the idea - sometimes I don't get around to meal prepping until mid-week (whoops), and sometimes it fits in better with my week to have one of the pre-packed lunches for a dinner (giving me more time to, say, go to the gym or clean the flat), and buy something cheap (and slightly less healthy) for lunch instead. Still worth it! I've got a lot of cheap lunch options near my work in the CBD, often the same or cheaper than buying new ingredients and cooking dinner from scratch, and certainly cheaper than getting something delivered. 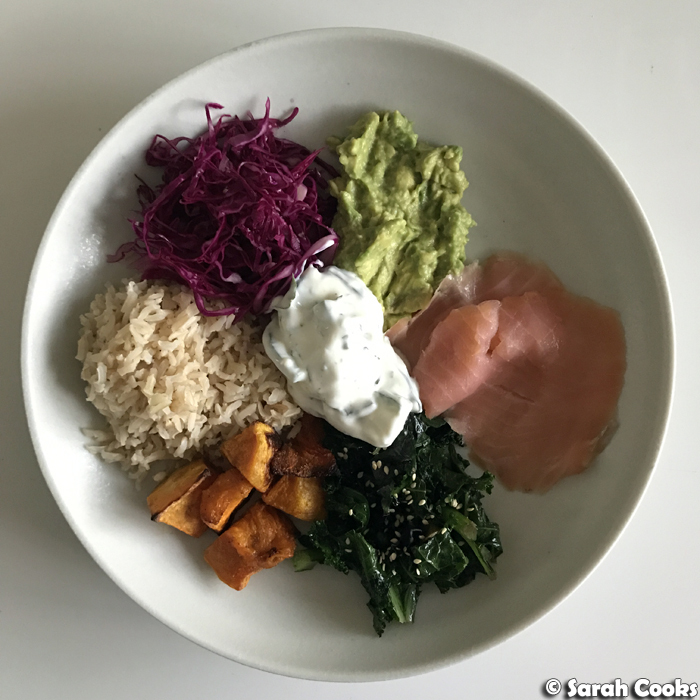 Today I want to share some meals that I've made over the past few months, plus some tips and tricks I've found useful. Hopefully this will give you some good ideas for your own meal prepping! From next week onwards, I'm planning to use Meal Prep Monday to share different meal prep ideas as often as I make them. 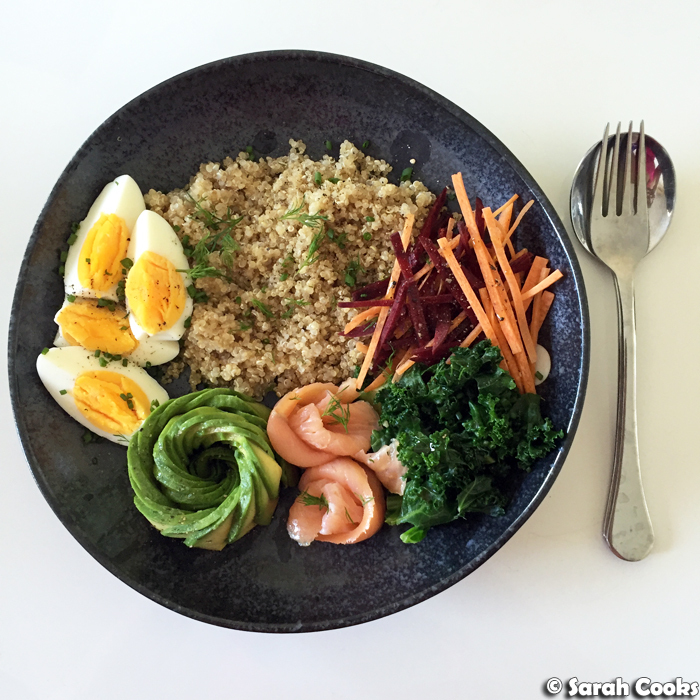 I like to follow the basic formula of healthy carb + lean protein + as many vegetables as I can manage. Of course, hardboiled eggs and / or avocado are always welcome! I figure if I'm inhaling lunch at my desk, it may as well be good for me. This is my favourite way, but it's certainly not the only way - Sandra, for example, often makes a big pot of soup or stew on a Sunday, so that we can have it for lunches and / or dinners throughout the week. Such a time saver! Let's start with the most basic, basic of meal prep - what I make when I've run out of time or energy to make something proper and I don't want to spend the week buying lunches. It's usually one of those single-serve microwave grains (brown rice, or sometimes quinoa), a tin of tuna in oil, some cherry tomatoes and cucumber. Ta-dah. (N.B. none of these products were freebies). 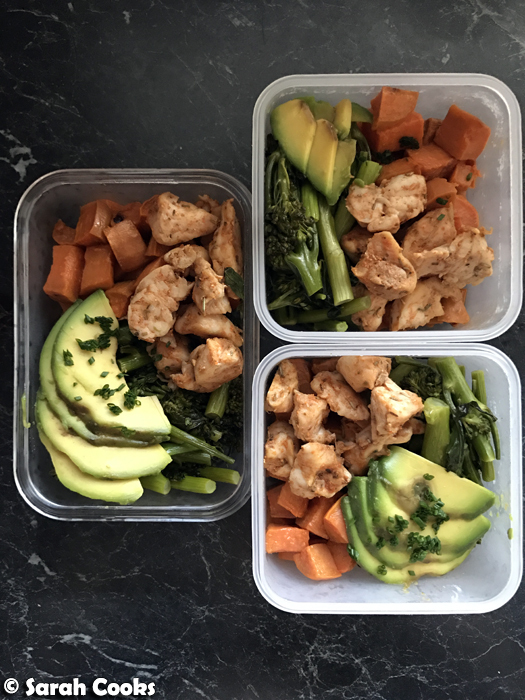 Here's the regular basic meal prep, beloved of body builders and macro-counters: marinated chicken breast, roast sweet potato, broccolini, and some sliced avocado. The good thing about this is that you can roast everything (apart from the avocado, duh) at once in the oven. Easy! I usually like to roast the sweet potato in cumin and a little olive oil, the broccolini in just oil, and the chicken in whatever spice mix or sauce I have on hand to mix it up a little - taco seasoning, cajun spice, Bavarian roast chicken spice, whatever. Here are some other meals I've enjoyed. I often use meal prepping as an excuse to use up leftover vegetables - you only need a small amount of each vegetable, and I'm happy to mix up different flavours and textures. You'll also see that some of these are in containers and some are on plates - sometimes when I make these on a Sunday I'll make extra so I can eat one straight away (and to get a pretty picture for Instagram, I'll admit it). This next one is a favourite - I got this recipe from an old issue of Donna Hay Fresh and Light, and it's so good! 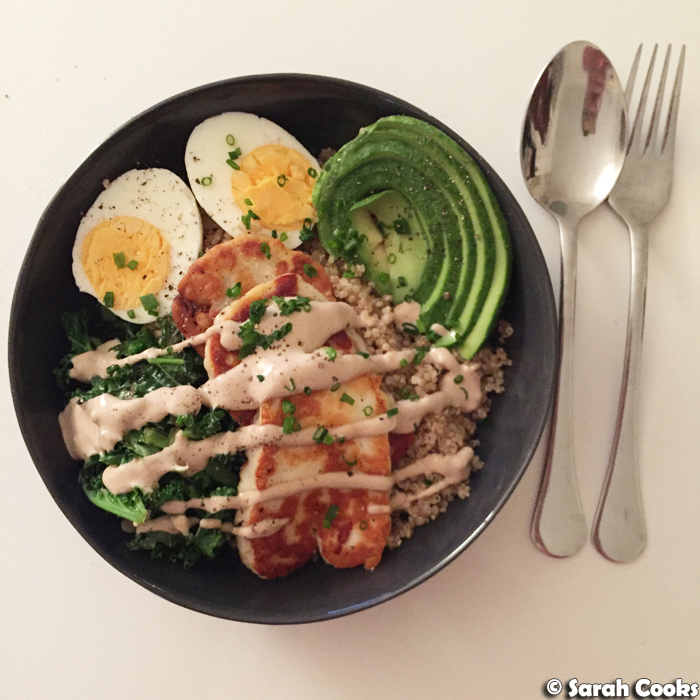 Quinoa, fried haloumi, sautéed kale, sliced avocado and a hardboiled egg, drizzled with a creamy tahini sauce and chives. I've made this numerous times, both in individual servings and for meal prep, and always love it. Do you meal prep? Do you have any tips or tricks you'd like to share? Favourite flavour combinations? How do you keep avocado from browning if you're prepping your lunches more than a day in advance? I have tried squeezing citrus (usually lime juice) over them or even doing a more through brushing on all sides with lime or lemon juice, but found that they browned to a certain extent by the time I got around to lunch anyway.